Despite the fact that landslide-dammed lakes represent less common lake type (n = 23; 2.6% share) in the Cordillera Blanca of Peru, these entities require appropriate scientific attention, because: (i) significantly influence geomorphological processes (erosion-accumulation interactions) at the catchment spatial scale; (ii) act as a natural water reservoirs and balance stream fluctuation on different temporal scales (daily to seasonal); (iii) may represent threat for society (lake outburst flood; LOF). 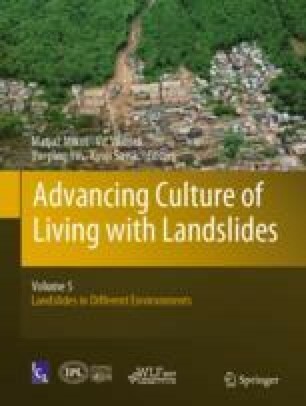 The main objective of this study is to provide inventory of landslide-dammed lakes in the Cordillera Blanca, overview on their typology and discuss their geomorphological significance exemplified by two case studies. Existing, failed and infilled landslide-dammed lakes are simultaneously present in the area of interest. Three sub-types of existing landslide-dammed lakes are distinguished: (i) landslide/rockslide-dammed lakes situated in the main valleys; (ii) debris cone-dammed lakes situated in the main valleys; (iii) lakes situated on landslide bodies irrespective their location. Lakes of sub-types (i) and (ii) reach significant sizes, while lakes of sub-type (iii) do not. The dam formation of lake sub-types (i) and (iii) is usually connected with a single event, while the dams of sub-type (ii) are usually formed by several generations of debris deposition over time. It was shown, that landslide-dammed lakes in the study area are characterized by relatively low mean lake water level elevation (4115 m a.s.l.) and large catchments (in some cases up to 80 km2), compared to other lake types. Lakes of sub-type (ii) are predominantly situated in central glacierized part of the Cordillera Blanca, while lakes of sub-types (i) and (iii) are situated rather in the already deglaciated piedmont areas, reflecting the conditions and mechanisms of dam formation. Two illustrative examples are, further, studied in detail: rockslide-dammed Lake Purhuay close Huari in Marañon River catchment; debris cone-dammed Lake Jatuncocha in Santa Cruz valley, Santa River catchment. The authors would like to thank Autoridad Nacional del Agua, Huaráz, Peru, for the long-term cooperation in high mountain lakes-related research. Grant Agency of Charles University (GAUK project No. 70 613 and GAUK project No. 730 216), Mobility fund of Charles University and the Ministry of Education, Youth and Sports of CR within the framework of the National Sustainability Programme I (NPU I), Grant No. LO1415 are further acknowledged.